Fully illustrated and beautifully designed, this is a unique and wonderfully creepy tale that is sure to delight Murakami fans. 'All I did was go to the library to borrow some books'. On his way home from school, the young narrator of The Strange Library finds himself wondering how taxes were collected in the Ottoman Empire. He pops into the local library to see if it has a book on the subject. This is his first mistake. Led to a special 'reading room' in a maze under the library by a strange old man, he finds himself imprisoned with only a sheep man, who makes excellent donuts, and a girl, who can talk with her hands, for company. His mother will be worrying why he hasn't returned in time for dinner and the old man seems to have an appetite for eating small boy's brains. How will he escape? 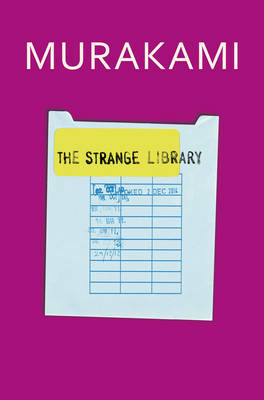 Haruki Murakami is the author of many novels as well as short stories and non-fiction. His books include Norwegian Wood, The Wind-Up Bird Chronicle, Kafka on the Shore, 1Q84, What I Talk About When I Talk About Running, Colorless Tsukuru Tazaki and His Years of Pilgrimage, The Strange Library and Wind/Pinball. His work has been translated into more than fifty languages, and the most recent of his many international honours are the Jerusalem Prize and Hans Christian Andersen Literature Award.